All told I probably got five hours of sleep. It was mild during the day and the temperature didn’t free fall until an hour or so after we attempted to go to sleep. I even made the mistake of taking off my socks (I normally don’t like wearing them to bed). Our tent was not on level ground so our sleeping bag slid towards the bottom. It was impossible to stay put and our feet froze against the side of the tent. That certainly didn’t help us sleep soundly. The dog even ended up in our sleeping bag at some point. Beth considered bolting for the car more than once. I woke up for the thirteen-fourteenth time at about 6:45am and it wasn’t hard to convince Beth to start our day early. We hopped in the car and I drove to the nearest sight, the Grand Canyon of The Yellowstone (only three minutes away). We had skipped this large canyon the previous day in favor of seeing the North Loop. The main roads of Yellowstone form a large ‘8’ and it takes far to long to see the entire thing in one day. Since it was before dawn, I thought the canyon would be a pretty cool spot to see the sunrise. There are two side roads on either side of the canyon. The South Rim Drive leads to Artist Point. There were eight other cars there ahead of us so evidently we weren’t the only ones with this idea. Beth was cold and tired so she stayed in the car with the dog. Being the adventurer that I am, I wasn’t going to let 23 degrees keep me from seeing an awesome sunrise! The walk from the parking lot was reasonable and while I was taking pictures of the canyon, an older French couple walked up. I noticed the man was wearing a Minnesota Twins hat so I pointed to my Minnesota Gophers sweatshirt. Through their broken English I gathered that they lived in Minnetonka, Minnesota (a West Metro Suburb where we have lived previously) for a couple of years. I don’t know how they ended up in Minnesota from France but they did like baseball! The three of us walked the rest of the way to Artist Point where a group of about twenty people was gathered. Two of the people were a young guy and gal really into photography. I love amateur photography, don’t get me wrong, but these two were talking about very complicated settings on their fancy cameras. Good for them. The rest of the group was made up of the Class of 1972 from a high school in Taiwan. I didn’t catch the name of the school but they were wearing hats with some kind of logo. I’m not entirely sure why the Class of 1972 would be gathering for a reunion in 2015 but that’s not important (whom has a 43 year reunion?). I spoke with one of the group members for a while as we all waited for the sun to breach the top of the canyon walls. Apparently, this class reunion has been in the works for a couple of years. Over half of the group now lives in the United States with the rest remaining in Taiwan. The reunion was attended by fifty or so people in total, this amount was all that wanted to get up for sunrise. He asked me about Minnesota. He was interested in my line of work and Minnesota sports teams (I happened to be wearing Minnesota Wild pajama pants, a Minnesota Vikings winter hat, and my aforementioned Gophers sweatshirt). I also told him the route we planned to take for the rest of our road trip. He was a very nice man and I wished him luck with the rest of their trip as the sun finally graced us with its appearance. The canyon walls slowly lightened leading up to the sun actually arriving. It was gorgeous. The Lower Falls of the Canyon, the bigger of the two waterfalls at 308 feet tall, were amazing. It was far cooler than the better known Tower Falls in my far-from-humble opinion. It was especially fun because I had never seen it before. My family didn’t get out this way when I was 16. After 45 minutes, 30 of which were spent standing in one small overlook, I was plenty cold and ready to rejoin my wife in the heated car. The dog was in my seat when I got back but she was more than thrilled to sit in mom’s lap. Although my toes were frozen in thin cotton socks and tennis shoes, I’d say sunrise was well worth the wait. I watched the sun come up with a French couple of Minnesota Twins fans, Ansel Adams and Annie Leibovitz, and twenty or so 61 year-olds from Taiwan. You can’t tell me that’s not a unique experience! From Artist Point, Beth and I drove back to the main road and then on to the Brink of the Upper Falls. The Upper Falls are not as tall as the lower falls at only 109 feet but the sightseeing walkway leads right up to the top of them. I only saw four other people there, an oddity within Yellowstone where it’s hard to see around other people’s heads sometimes. Next up was the North Rim Drive. There are several spots to park along this side road to view the canyon. With names like Lookout Point, Grand View, and Inspiration Point, you cannot go wrong! The first two are closer to the Lower Falls than Artist Point on the South side while the third accesses the Eastern part of the Canyon downstream. You can’t see the Falls from Inspiration Point but the colorful canyon walls are still worth the visit. I can’t describe the science behind the colors so I’ll let an informational sign do it for me. “Mineral stains mark the sites of hot springs and steam vents in the canyon walls. For thousands of years, upwardly percolating fluids have altered the chemistry of the rocks, turning them yellow, red, white, and pink.” Very cool! There are a number of hiking trails available along both sides of the canyon, something to add to my list for our next visit. I’d like to see the both waterfalls and those beautiful walls from closer up! Beth and I returned to our campsite in Canyon Village. Our day was just starting and we had already seen so much. It was still cold but the sun was now fully risen and warming up. Breakfast was quick with no time to waste. Technically we only brought cold and dry ingredients, which don’t take long to prepare, but still, no time to waste w ith the South Loop waiting for us! Beth went to the bathroom before we left and sprained her ankle miss-stepping off a small step. She has weak ankles and has experienced this before, once on the very first load on moving day. She also suffered a deep scrape when her leg hit the rough ground. It wasn’t the best circumstance for an injury but we made do. A Park Ranger in the campground office had band-aids. For some reason, Beth had not packed her ankle brace despite her aforementioned cursed ankles. We left Canyon Village and headed South to continue our day (which it looked like I would be driving most of). We backtracked through Hayden Valley, home to largest herd of buffalo in Yellowstone. They often block the road as they seek fresh prairie grass to eat. Despite plenty of, um, evidence that all bison are indeed male, we did finally see some baby bison and their mothers. It’s possible the females are more protective of their young and that’s why it is the males you see next to the road all the time. There were some jokers taking photos of the herd along the Yellowstone River (really far from the road). Remember, fit people are no match for fully grown bison, much less tourists in flip flops and giant cameras! We made a quick stop at Sulphur Caldron and then a longer one across the street at Mud Volcano. Steam and rotten egg smells emanate liberally from both sights. There was even a natural steam vent in the middle of the parking lot at the former. It was paved over with asphalt and then opened itself up through the natural construction tool of extreme heat! Beth stayed in the car at Mud Volcano so I could walk around the thermal area. Hopefully the next time we visit we’ll have a Harry Potter-addicted child willing to sit in the car with the dog so she can go too. No, I hope we can visit Yellowstone again long before our future kids can read. The series of walkways and staircases at Mud Volcano combined to form a fairly lengthy and laborious walk. I saw a sign that recommended walking in a clockwise direction as it was less steep (after doing the opposite). 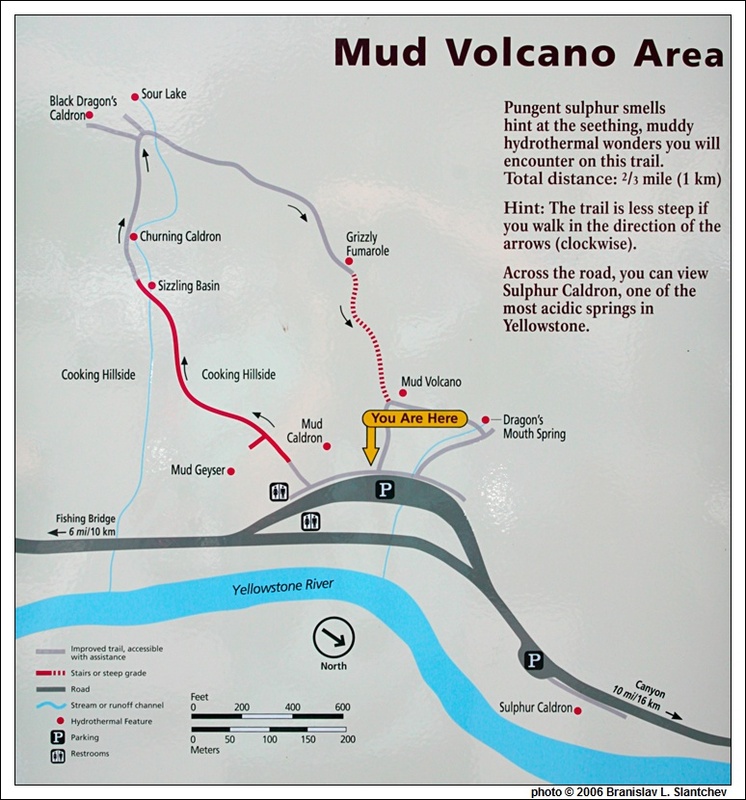 Mud Volcano may be the named attraction but my favorite feature in the area was called Dragon’s Mouth Spring (below). This spring is violent and loud. The water, which I can only as sume is incredibly hot, spits out of a cave at about a 45 degree angle with a loud swoosh each time. It was named, obviously, because it sounds like a Dragon’s breath. It also smells like what I assume a Dragon’s mouth would smell like. The water that leaves the pool below the spring is forest green, evidence of algae that lives in the slightly cooler waters. Because this area is on a hill there are many interesting streams of scalding liquid flowing down. I walked all the way up the hill (the steep way) past Grizzly Fumarole to Sour Lake. The walk down was more pleasant but it was getting quite warm. When I got back to the car, I switched into shorts. The weather was far more cooperative the rest of the day. There were hardly any clouds in the sky at it reached the mid-70s. Beth and I got back on the road and headed South for Lake Village. There is a large yellow hotel just off the water of Lake Yellowstone. I bet rooms there cost a pretty penny! For the next half hour we drove West along the Northern shore of the gorgeous lake. It was a beautiful shade of blue. We took another side road called Gull Point Drive and reached West Thumb Geyser Basin just after Noon. I found a fantastic parking spot right in front by the trail entrance. Beth’s ankle was still painful but she decided to give it a go. This particular walkway had handrails at least. We saw a dozen bubbling pools varying greatly in size and color (check out the map image below for their names). The path along the interior of the circle provided us with a lot to see and wasn’t quite so long for Beth to walk with her injury. She headed back to the car when we reached the Western side while I went just a bit further to investigate Abyss Pool and Black Pool. Both were stunning (pictures below). Abyss was a medium shade of blue with a large portion on one side that was orange-red, many colors in one pool. The colors stay separate because they have different temperatures and contain different bacteria. Black Pool was a misnomer as it was actually a vibrant light blue. It was perhaps the coolest pool I saw on the entire trip. I wish I could recreate its look perfectly as a swimming pool (non-toxic and non-scalding, of course). The liquid was so clear I could see the sides and bottom of the pool with incredible detail. Both pools were a short distance from the lake making the overall view a real winner! Nature truly is spectacular. From West Thumb we made our way West over the Continental Divide, through Craig Pass (8262ft), and over the Continental Divide again. We stopped at the Kepler Cascades, a series of rapids and waterfalls very close to the road. I was able to walk along the river and even down the cliff about twenty feet to take pictures. Beth didn’t attempt to follow me with her ankle still bothering her. There are hundreds of waterfalls in Yellowstone and they’re all worth visiting. Our next stop is the most famous Geyser in the world. We arrived in the parking lot of Old Faithful right as the geyser was erupting. That meant we’d have to wait 50-70 minutes for the next eruption but at least we found another great parking spot. With our hour wait we accomplished many things including making sandwiches, walking Maeby, checking out the Visitor Center, and browsing the gift shop of Old Faithful Inn. We spent a decent amount of money on souvenirs and when I got to the register, the cashier told me about a special price on decorative Yellowstone fleece blankets (only $14.99 when you purchase $50 of other merchandise). I told him, “You had me at blanket!”. I wasn’t going to suffer through another 23 degree night in a tent without an extra blanket and we already accumulated $50 worth of stuff (including wool socks). It’s a thin blanket but it was extremely helpful that night. It’s pretty too! While the nights were freezing, the weather during the day was priceless. It was mid-seventies and sunny. I was worried about traveling in September but we got really lucky. If anything it was a little warm waiting for the show. There are two rows of benches along the edge of the viewing area and Beth found us a good spot. We didn’t have to wait too long for Old Faithful to live up to its name. We had both witnessed the eruption on previous trips, myself once and Beth about twenty times. Every time her family drove through Yellowstone they would stop to see it. Every time. I’m jealous of all the cool Yellowstone trips, certainly. Hopefully Beth and I can take our eventual family to Yellowstone on a regular basis. Hell, if we ever gain financial security, I’d go every damn summer, why not?! Anyway, the geyser went off for a couple of minutes. It’s not the tallest burst of water throughout the park but that’s not why it’s famous. The line to get out of the parking lot was horrendous so we ducked inside another gift shop nearby. It was a lot bigger and we were able to kill 20 minutes to let the traffic subside. Here’s a mini tip for you, the Old Faithful related traffic is just as predictable as the geyser itself. Just leave half way between eruptions and you won’t lose too much time waiting for slowpokes from Florida to drive forward like a normal person. After Old Faithful, our next stop was Biscuit Basin, another large group of thermal features. I ventured out on my own again but took enough pictures for Beth to get the full tour. From the parking lot there is a bridge over the Firehole River to the various pools and springs of Biscuit Basin. There were light blue pools on one side and mus tard yellow creeks on the other. Some of the pools were crystal clear again so I could see the detailed walls. They were very interesting to gaze into. Off the walkway, about 100 feet away, a lone buffalo was grazing in the nearby meadow. I wonder how easily they can tell when they are approaching a hot spring that might harm them. There are signs all over warning tourists not to venture off the boardwalks, of course. At the end of the boardwalk there was a trail leading toward Mystic Falls. “Next time”, I had to tell myself. Next time. Midway Geyser Basin was next as we continued North on the Grand Loop Road, the Southern loop in the ‘8’. Beth actually went with me to explore this time! A large footbridge crosses the Firehole again (that’s kind of fun to write) where the bank of the river was covered in yellow and orange flows on the far side. The yellow was brighter than the mustard of Biscuit Basin while the oranges were very bold. The colors were beautiful but the massive volume of water was also impressive. More than 4000 gallons of water (mixed with various chemicals from the springs) pour into the river every minute! The waters are so hot that it actually raises the overall temperature of the river downstream by five degrees. The first feature up the hill was the Excelsior Geyser Crater (Beth loved that hill with her heavy ankle). Excelsior Geyser was once capable of 300 foot eruptions in the 1880s but is now just another boiling pool covered in steam. It’s really big and a beautiful shade of blue, of course, but it’s not capable of the shows it once produced. Midway Geyser Basin doesn’t have a large quantity of thermal features but is home to the Grand Prismatic Spring. You have probably seen pictures of this spring without even knowing its name. The picture at left is an aerial view (my pictures of the area will be below). Look at those colors! We couldn’t see any of the rich blues and greens from the walkways, only the orange-reds. That’s because Grand Prismatic gained notoriety for its size as well as its colors. It is 370 feet across and 120 feet deep. We walked along it for about 80 feet. It looks like a giant sea of tomato soup but smells sulfuric. The steam wafts over you as you walk like entering a sauna. I don’t like saunas personally so I felt better once I was rounding the walkway near Opal and Turquoise Pools. Right as we were leaving, a tour bus with a hundred or so people arrived, good timing to be move on to the next sight. Just a quick trip away was the next side road, called Firehole Lake Drive. We saw Firehole Spring and Surprise Pool briefly and then stopped at Great Fountain Geyser. It was bubbling a bit but it was late in the day so we didn’t stay long. We moved on to White Dome Geyser 200 yards away. Right as we parked at White Dome, Great Fountain erupted (below). It goes off once every 9 to 15 hours and we just happened to catch it! Eruptions can last up to two hours but we only watched it for five minutes. White Dome, a 12 foot cone geyser, started smoking as well but we couldn’t wait around forever for it to go off. Daylight was limited. Further along the the drive we passed over Tangled Creek, a beautifully patterned creek made up of dozens of small waterways through the meadow. That same water flows to Hot Lake, which we saw next. Across the road is Firehole Lake. Both lakes have geysers around them, one of which was called “Young Hopeful”, which I found fun compared to “Old Faithful”. We rejoined the main road only to go across the street to Fountain Paint Pot, another series of geysers and pools. Beth’s ankle was feeling better, enough that she was able to accompany me again. We saw more bacteria-colored pools and Fountain Paint Pot, a large, grey, bubbling spring. The bubbles were constant and made for easy picture taking. Another cool name for a feature, “Red Spouter” didn’t exist until an earthquake miles away caused a fresh rift to open. Neat! 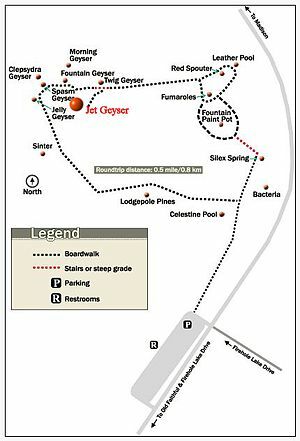 If you’re a geyser fan, do not miss this area. The boardwalk led us between seven smaller geysers. Two of them were active as we approached, Fountain Geyser and one other (I don’t remember which). We had plenty of time to take pictures and videos as they continued to erupt for several minutes. In fact, we walked away before they stopped. Jets of water 25 feet in the air are awesome to see, obviously, but Maeby was waiting for us and there were more stops to make that day. On the way out (it’s a loop) we saw the Lodgepole Pines, some petrified trees stuck in the white, thermal muck. I don’t think muck is the right word but it’s the best I’ve got. Next we headed down the one-way Fountain Flat Drive (always take the side roads!) where a small herd of bison was grazing. A couple of them were pretty close to the picnic area. Further North we saw a sign for Firehole Canyon Drive and took that too (do you get it yet?). The sun was going down and the views of the canyon were spectacular. It’s a narrower, tree-filled canyon with gorgeous river views. About half way down the road we saw Firehole Falls (funny name). It’s only 40 feet high but the water is white as it rushes over the falls. The rocks in Firehole Canyon were also of interest. We stopped a couple of times so I could take pictures. it was nice to have it mostly to ourselves. Towards the end of the side road we saw a swimming area. For all I know it’s the only swimming area throughout the park. I’m sure hikers have swam in rivers all over Yellowstone but this was a dedicated swimming hole! The small parking lot was packed (I guess we found all the people). Next time we’re there we’ll have to check it out. Like I said earlier, the water in Firehole River is warmer given all the thermal features dumping water into it. I bet it’s a pleasant place to hang out. The sun was setting and we started to head home for the night. The 84 foot Gibbon Falls is just barely visible from the car so we stopped to check it out really quick. The sun was still lighting up the trees in the valley off in the distance but I was in shadow behind tall cliff faces. It was cooling off again without the sun and I was glad to be headed back to a warm bed frozen air mattress. We had driven over the stretch of road between Madison and Canyon Village in the dark the day before and had not seen the side road to Virginia Cascades, a 60 foot waterfall. It was still light enough to enjoy one last side road for our Tuesday! It was beautiful. All I want to do when we retire is travel beautiful roads like that one at all times of the day. The Virginia Cascades at dusk were fantastic. There was no one else around. Beth and I (and Maeby) could have stayed there for hours just staring at it but we had winter clothes to put on and a tent to fill with blankets. End of day four.